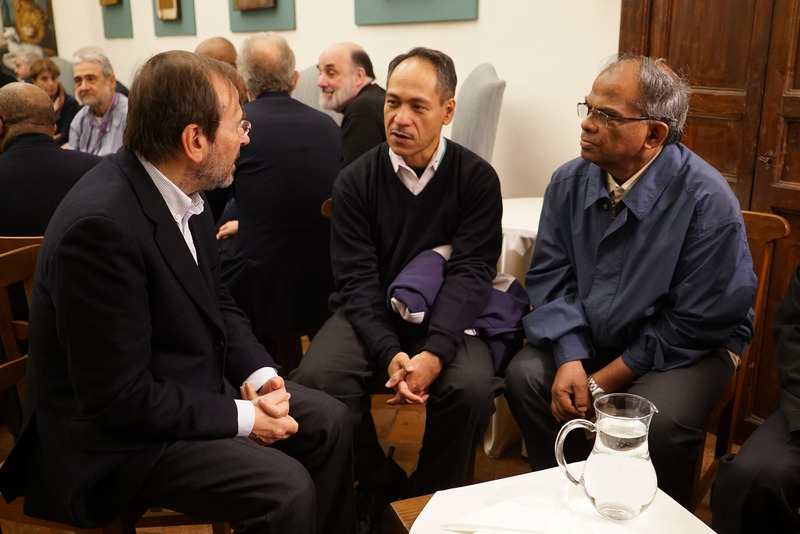 Beyond electing the Superior General, the task of a General Congregation also includes preparing for the direction the Society of Jesus will take in the coming years. How can a diverse group of more than two hundred men reflect together in order to come to consensus? Specific topics need to be considered at various levels. Above all, at the personal level. Private time is essential so that each delegate can pray over and reflect on the subject at hand. Each one has the opportunity to focus on his personal position, thoughts, and interior movements. The delegates also engage in informal exchanges with one another to see how the various approaches at play could help to expand their personal horizons, to consider the matter from other points of view, or to be aware of other nuances. Next comes meetings in sub-groups, which could be mixed, in a common language or by assistancy or conference. Small groups allow an easy exchange that favors finding areas of agreement at the intellectual, emotive, and spiritual level. Bit by bit, by listening to one another, common understandings begin to form; consensus emerges around certain aspirations, and others that seemed important drop away. Finally comes discussion in the aula, where an exchange among the entire assembly becomes the occasion to clarify one’s own position and to recognize what really matters to the whole body of the Society. As if through a sieve, one’s own ideas meet and clash with those of others; are formed and modified in order to sift out all personal interests, even involuntary ones; and become a straightforward, transparent search for the common good. For better help and advantage, both to the one giving and the one making the Spiritual Exercises, it should be presupposed that a good Christian must have a preference to defend rather than condemn the statement of another. If he cannot agree with it, he should seek to clarify in what sense the other means it. If the other’s understanding is in error, he should kindly correct it. If this does not work, he should take every appropriate means to bring him to a correct understanding, so that he might save himself. The “Presupposition,” as it came to be called, requires that we place ourselves in an attitude of deep and serious listening to the other, searching to understand what he is trying to communicate in his words and in his whole demeanor. This intentional, non-judgmental listening seeks to plumb the depths of what the other is communicating. On the other hand, if you are talking about a specific topic, it takes a freedom of spirit (Ignatian indifference) and an effort to go out of oneself and one’s personal interests in order to seek the good of the entire group. Putting oneself before the Lord to consider a question, even one that is not explicitly spiritual, helps in freeing oneself from preconceptions, prejudices, and ideologies often at work, even unreflectively, in our way of thinking. This requires silence and concentration, but above all, the desire to serve the common good. Spiritual conversation is a process based on reciprocal trust that involves not only a relationship with the other, but also spiritual and personal dimensions. Naturally, putting this type of communication into practice is not without its challenges, especially when it comes to reciprocal understanding. At times it is difficult to reach understanding, especially when there are misconceptions or ambiguities around how to think about some categories. However, when you’re aware of the good intentions of the other and you find yourselves laboring together for common understanding, something extraordinary happens: the group comes to a place of being able to recognize in a clear way where the Holy Spirit wants to lead it. And the sign that makes everyone aware that this is happening is the consolation that fills the hearts of each person.